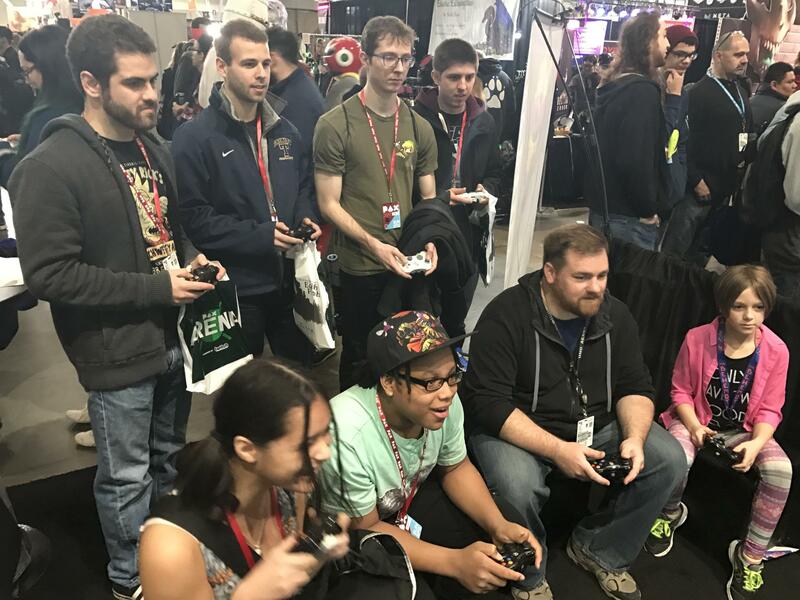 When preparing for PAX East I saw this article from another indie dev, found it quite useful, and thought I'd share my experience, also as a first time exhibitor, complete with lot of interesting numbers. I exhibited Splody, my multiplayer action game that supports any number of players. I wanted to showcase this, so opted for a larger 20'x10' booth and planned on having both an 8 player station and a 4 player station. I used two 55" TVs, hooked up to tiny, cheap UltraSlim computers, with wireless controllers for all. One TV I put farther in the back, on a lower table the convention provided, so that I could get 4 sitting and 4 standing in front of it. The other TV I put on a stand, as high up as is comfortable to look at, closer to the aisle, so that people walking by had something to look at. Though they were both running the same thing, we demoed the game slightly differently at our two stations, and, unfortunately, I have no idea which made better impressions. The smaller station (up front on the right) had only 4 controllers hooked up, and almost always got a set of new players simultaneously, which gave the person working that station time to both explain all of the basics, and go into what each of the powerups did, for those not familiar with them. The larger station, with 8 controllers, we tended to get people into the game much quicker, and not hesitate to add new passersby mid-match. This led to larger, more entertaining games, but meant a lot of people got only the barest intro to the game "you're the guy in the lower right, press A to drop a bomb, don't blow yourself up, go!" and then, later "after you're dead, you can still place bombs!". Depending on the person's gaming experience, I think this often worked quite well, but once in a while left people baffled, or with half of an explanation which then got aborted when a match ended and one group left. Since we had so many controllers, it was easy to get spectators to join in - their friend, or child, is playing, and we just hand them a controller, and they almost always enjoyed themselves. We found that, somewhat to my surprise, even with 12 total controllers, we often had almost all of them in use, with people standing behind and watching as well. It helps that our controls are simple, and the game is quite entertaining to watch. I made the questionable decision of using only wireless controllers, since untangling a mess of 8 controllers constantly and threading wires between sitting players did not sound fun. This actually worked out great - I was afraid some of them would disappear, but none were stolen. We had to switch batteries on about half of them each day, but the biggest issue was range - a few of the controllers would often flake out if more than about 6 feet from the receiver, possibly when their batteries were getting low, or possibly because there were so many electronics in the expo hall. It was only occasionally an issue, and Splody handles people dropping in and out pretty seamlessly mid-game, so we just handed them a new controller, and swapped the batteries before handing it out again. The second biggest problem was people don't like using controllers with lights off - there are only 4 lights on the Microsoft Xbox 360 controllers, so controller numbers 5-8 don't have any lights on at all, so we would often hand someone a controller and they'd try to turn it on, sometimes take the batteries out and put them back in, then hand it back saying it's dead, and we'd have to hand it back saying, nope, it's working, see, you're that guy there. Before going to PAX, I thought long and hard about why I was going to PAX. It's important to know your primary and secondary goals, and orient your strategy and how you pitch people to those. For me, the primary goal was exposure - this means getting as many people playing and talking about the game as possible, especially streamers and press, as well as getting mailing list sign ups. The secondary goal was sales, as I was selling Steam keys there at the convention, however I realized that even if I had what I considered an incredible number of sales, it would still only cover a very small fraction of my costs, so sales were an extra bonus, not the primary goal. Using this, we tried to make sure that, after getting people to try the game, we let everyone know when the game was releasing (next week! ), and that they could take a card or sign up for the mailing list and get a pin. Other common goals for exhibiting are getting feedback on an early version of a game (not for me, this was my release version), brand awareness (not a big deal for me, as this is currently my first and only game), and business contacts (publishers, etc). 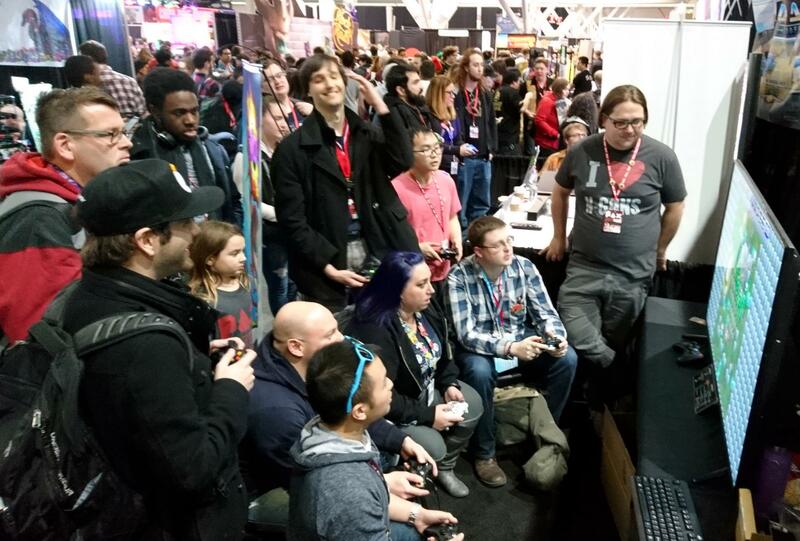 The other reason to go to PAX - it's fun to play my game with people, and watch them play my game! After looking at the exorbitant rates for renting TVs, TV stands, and seating at the convention, I decided it would be cheaper to buy my own - it was often half the price, or less, to buy something than rent it. However, shipping a large amount of things, including two 55" TVs, is not simple nor cheap. It would have been somewhat cheaper to buy the TVs in Boston, and just ship them back (or leave them there! ), however I wanted to have everything in hand to "beta test" my booth with friends in my living room before shipping it out, so that I could relax knowing all of the hardware will be working just fine with each other. 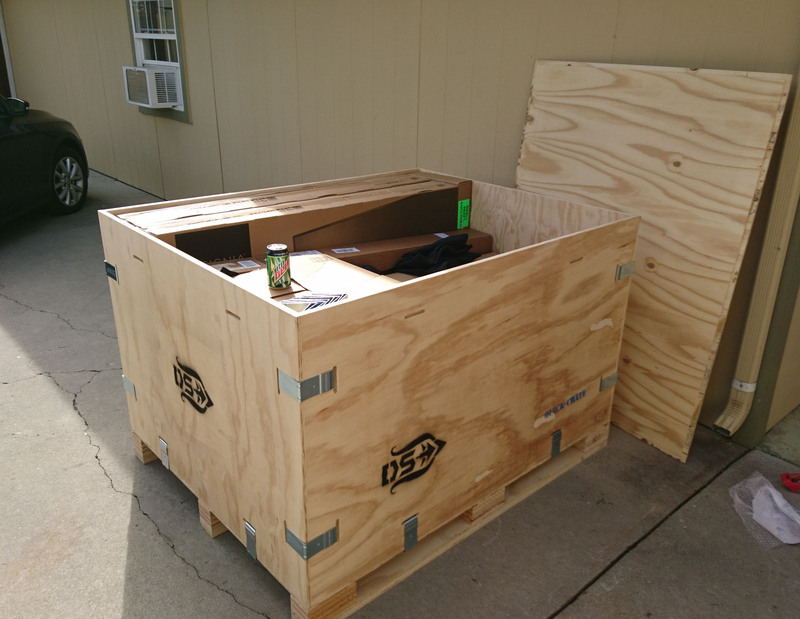 Taking advice from Indie Boothcraft, I purchased a Quick-Crate, however I needed their largest to fit the 55" TVs, and the cost of shipping the empty crate to me was more than the cost of the crate itself. I'm not convinced it's worth the large cost, however I have not thoroughly investigated alternatives, and, now that I have it, I will probably continue using it for many conventions to come. I'm a one-man company, so I did not have any default people to bring along, so I had to rely on friends and a friend of a friend (well, WoW-raid-leader-of-a-friend). I aimed for getting a total of 5 people (ideally already on the East Coast) working my booth, but ended up with 4, one of which I flew from the West Coast where I am located, and most of my friends are. Despite some illness and one of the volunteers having never met any of us in person before, everything worked out quite fantastically. Setting up the booth took a little less than 5 hours, with anywhere from 1 to 3 of us working on it as people's flights arrived. I'd set up the complicated stuff (TV stand, TVs, computer) before shipping it out, but no one else had seen any of it before, so I think we did pretty well. Two people would have been plenty. Tearing down the booth and packing it back into its crate took 3 of us 1 hour and 20 minutes. 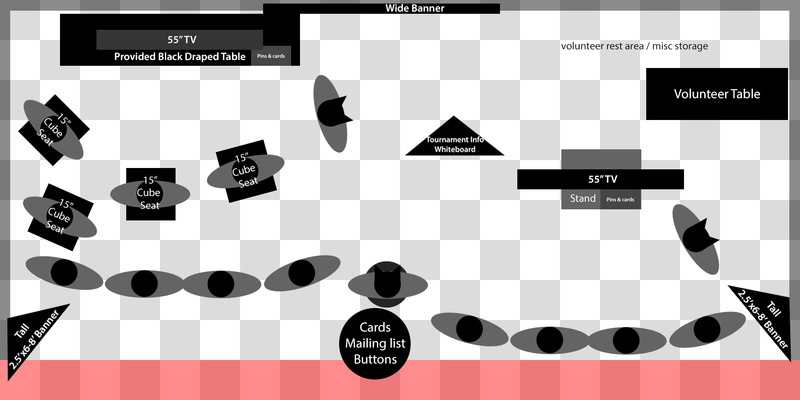 We almost always had 3 people manning the booth - one at each station, getting people into the game, explaining controls, etc, and one person at our table in the middle handling mailing list signups and sales, tournament signups, giving out pins, and generally answering questions. The 4th person got to take a break, although we were all so engaged in working our booth that we did not see much of the rest of the convention - I tried walking around a bit, but it was just sensory overload and I decided my breaks needed to involve just relaxing after that. 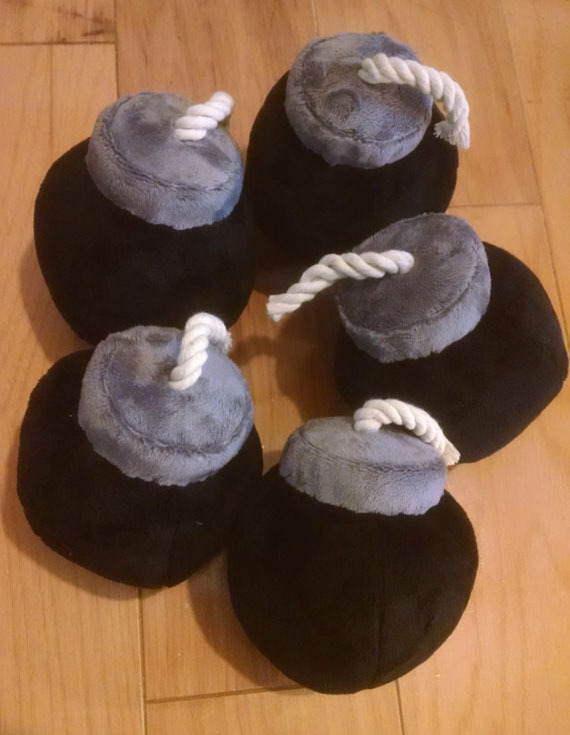 We ran a daily tournament for a bomb plushie. 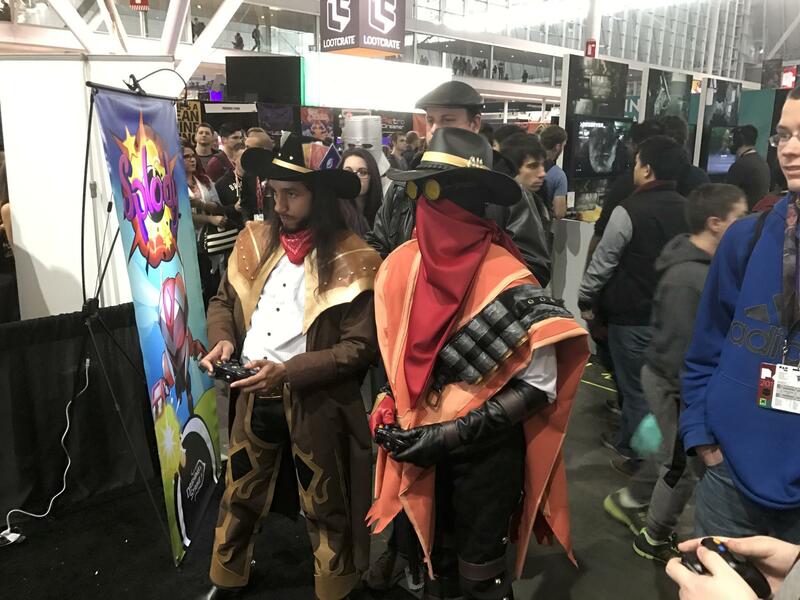 The tournament had hourly matches which had anywhere from 3 to 8 people show up (often if it was 5 minutes before the hour and 4 or more people just finished playing, it was a very easy sell to get them to stick around for the tournament). The top 2 from each hourly match were entered into the daily finals which took place at 5PM, and we got anywhere from 6 to 10 people showing up for the finals (often one of the hourly tournaments just had no one sign up, but Saturday was busy). The people who won the tournaments often came by multiple times in the day, sometimes with different friends in tow, to practice and play with their friends, which was great to see. I think I will do tournaments again, because they were a lot of fun, though it's hard to say if they made much customer impact. Ah, finally time for the numbers! $759 - Double-layered carpet padding - taking the advice I'd heard at PAXDev, I ordered the softest padding available for my booth, which meant me and my volunteers were not as sore at the end of the day, and by the end of the day attendees enjoyed being in our booth just because their feet suddenly felt better. Would buy again! $2146 - hotel - 1 night someplace cheap, 4 nights fairly close to the convention center. Not knowing exactly how many people I'd have to be putting up, and with a lot of rooms unavailable, I got a 2-bedroom suite near the convention center, which worked comfortably for the 3 of us who stayed in it. Could have found a cheaper place if booking earlier, or willing to be farther away, but being comfortable, sleeping, and resting are very important when exhibiting all day! Some days it was too cold and windy to walk the 5 blocks to the convention center, so we took a taxi anyway, so perhaps being so close was not as important as it is in warmer locations. $330 - Taxis. About half of this was just getting to/from the airport, the rest was going to/from the convention center and our dinner outings. Shipping - I shipped a crate containing most of my booth, totaling approximately 500 pounds (almost half of the weight is the crate itself), from California to Boston. $754 - "Material Handling" fees - the convention charges a fee of about $150 per 100 lbs (rounded up, of course, so my crate was 495 lbs) for any freight received (even if shipped through the official convention shipping), and for that fee they will deliver your crate to your booth before the setup day, remove and store the (mostly empty) crate during the convention, return the crate to your booth after the convention has ended, and handle getting it picked up by your preferred shipping line. They do not allow you to handle your own freight or hire people to do so, however anything you can carry in on your own is not subject to this charge. $14 - Tarp to keep crate dry, both while packing it in my driveway, and for long-term storage. Furniture and Electronics - I could have rented a lot of this, or brought my own, so I'm providing a breakdown of what I paid, an estimate of the shipping cost (ignoring the cost of the Quick-Crate itself, just the shipping and material handling fees to get it there and back), and what it would have cost to rent from the official rental service (if available). Though the cost to rent a lot of these things seems exorbitant, the cost to ship them was quite comparable, although a straight comparison is not quite fair since a bunch of things (banner stands, computers, etc) had no rental option, and I'd have to ship (or pay a couple hundred dollars in airline fees) to bring them as well. If this were the only convention I ever go to, I definitely should have just rented, however, if I go to other conventions (and geographically closer ones, like PAX West or South), I think I will have saved money by purchasing everything I needed. The relatively hassle-free setup that comes from having all of your own equipment and knowing it will work is also worth something. $169 - 750 Buttons from Pure Buttons, we went through around 600 of these, giving them out to anyone who signed up for the mailing list or asked nicely. $720 - Artwork design for banners and cards, including a print resolution version of my company and game logos. Being a 1-man company, and having no art skills, I rely on contract artists and I got the company that did my game art to work on my booth art as well. $46 - 2000 cards with the game logo from OvernightPrints, we went through a little under 1000 of these. $187 - Banners from AllStateBanners - One 4'x5' banner for the back plus two 31"x71" banners for up front. I paid a little extra for these due to not having the final banner designs ready until a little later and was unable to take advantage of their free shipping. $58 - Insurance. PAX and the convention center require you to have general liability insurance. This was a bit of a pain to find online (insurance people seem to want to actually talk to you on the phone), but Hiscox worked for me (you can add the required additional insureds (e.g. the Convention Center) after purchasing the policy). $68 - Last minute shopping in Boston. This includes a cheap table from Target that we used (combined with a black bed sheet) to keep most of our stuff out of view and have place for volunteers to rest, a hand sanitizer for people to use after using controllers or shaking hands, and a bunch of supplies for the volunteers in the booth including fruit, granola bars, soda. $60 - Airline extra checked item fee to bring the banners with me (they were printed after shipping the crate). Carpet padding - did I mention this was great and worth the cost? Since Splody goes on sale on Steam next week, I cannot measure any bump in sales, but I can share all of my other numbers! 119 Steam Keys sold, given to press, given to streamers, etc. We were asking for $6 a copy at the booth, but also doing a "4-pack" (for $18, though people often paid $20), and doing a "pay what you want" ("if you're not going to buy it until it's half off on Steam, give me $3 right now, or, if you want to support an indie developer, give us more! "), which got a few $10s and a few $4 sales. I can say that I was happy with how many people saw the game, played it, and enjoyed it. It was great meeting people and seeing them enjoy what I've been working hard on. And, finally, I release next week, go add it to your wishlist on Steam!